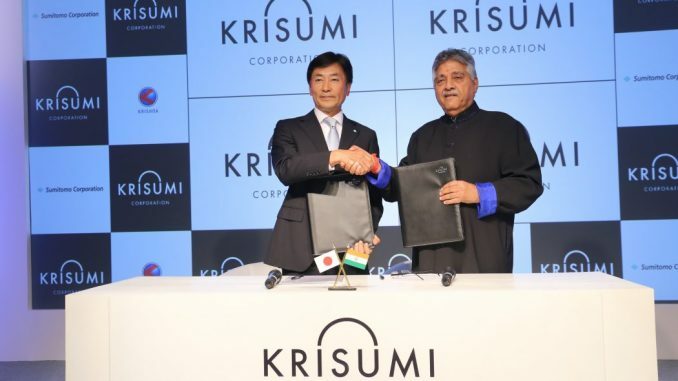 NEW DELHI: Japanese trading house Sumitomo Corp. is forming a 50-50 joint venture with India’s Krishna Group to develop so-called integrated townships, beginning with a $2 billion project in the northern city of Gurgaon, the partners announced Thursday. The Gurgaon development, with a total built-up area of around 18.5 million sq. feet, will proceed in eight phases. The first will be apartment towers targeting India’s upper middle class, the companies said. The joint venture is named Krisumi Corp., and the Gurgaon project, near New Delhi, will be called Krisumi City. “We will initially start with 430-440 apartments,” said Ashok Kapur, chairman of Krishna Group, a conglomerate that has interests in such diverse areas as auto components, media, travel and entertainment. “Later on, there will be hotels, shopping centers, commercial and office spaces, schools, hospitals, etc.,” he added. Kapur said construction will start this year, and the first residential phase should be completed in four or five years. Though the design and pricing of the units have yet to be decided, apartments in Krisumi City are expected to start at 10 million rupees ($153,000). The master plan and architectural design of Krisumi City were developed by Japanese design firm Nikken Sekkei, the name behind the 634-meter Tokyo Sky Tree tower. Sumitomo’s Masahiro Narikiyo, left, and Krishna Group Chairman Ashok Kapur mark the launch of the real estate joint venture in New Delhi on Feb. 22. He noted that his company is already involved in sectors such as automotive parts manufacturing, energy and agriculture in India. Tokyo-based Sumitomo, Narikiyo said, has developed 300 real estate projects globally, including in Japan, the U.S., China, Singapore and Indonesia. The Japanese trading house also has a joint venture with Mahindra & Mahindra group’s real estate and infrastructure arm, Mahindra Lifespace Developers, for an industrial park in Chennai, a city in India’s south. “There are great opportunities in this country, not only in big cities but also in rural areas,” Narikiyo said. Krishna Group’s Kapur said buyers want commitment, quality and delivery. With Sumitomo bringing its expertise to the venture, consumers will be assured of all these things, he said.